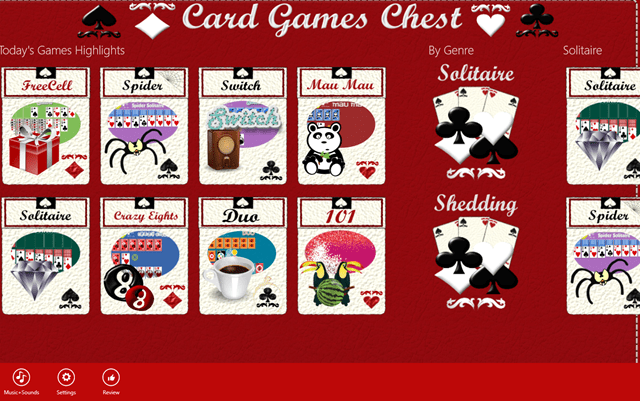 Card Games Chest is a Windows 8 cards app for those who are very much into playing cards. 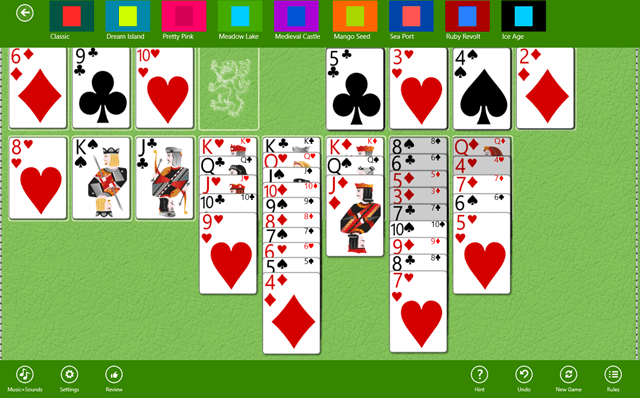 This Windows 8 game app consists of some of the best card games which you can play in your pass time. You can get a wide variety of card games here with such a beautiful playing environment. You can select any card game from here at this app for Windows 8 and can have a nice time playing it. This is somehow the old card games you used to play on your desktop but this is something new. You can select any card game from this single chest and can play with more fun of collecting points in terms of coins. There are genre specific card games which you can select and can also get all kinds of tricks and tutorials from here, if you are new to the world of cards. This is how the interface of this Windows 8 app looks like with the bright red shimmering color. There are around 8 different kind of card games that you can play here like Solitaire, FreeCell, Switch, Mau Mau, Duo etc. You can choose from any of these and can also purchase new games from the Internet. Here you can get the information about various genres like Solitaire and Shedding you can play with all kind of tutorials and themes with various settings and reviews. You can also simply click on any of the game and can play directly form here only. This is how this Windows 8 cards app looks like and the most delightful thing is the soothing background piano music which is my favorite. You can choose your own background theme which will suite you most while playing. You can also get some hints while playing the game when you are not sure about your moves. 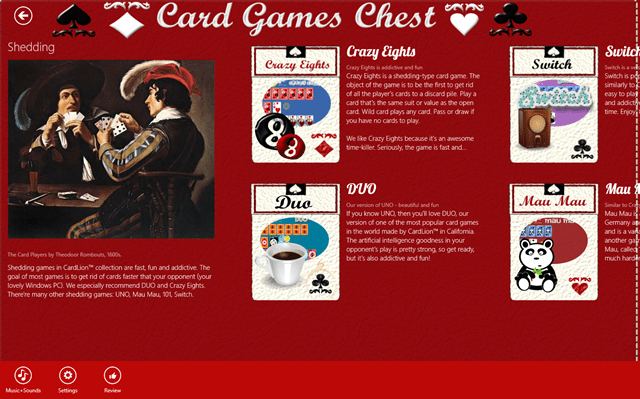 So, just install this Windows 8 cards app on your Windows 8 desktop and have fun while playing your favorite card games.